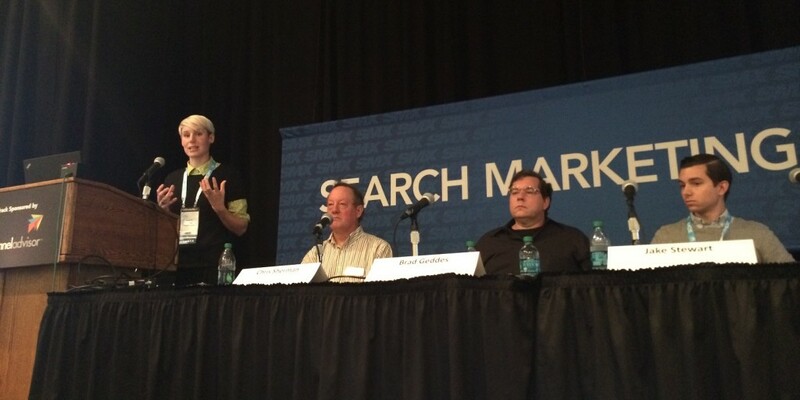 Next up on Day 2 of SMX East, PPC pros share their top tips on testing ads. Discover what matters most when it comes to creating, testing and measuring ads. Albright tells us to always be testing – always have two or three ads running that are bouncing off each other. But where do you focus your ad copy testing? Spend extra time to customize ad tests – we may break the tests into pieces. How do you break them down? Albright mentions a client who had software – in an ad that mentioned that they also had long-term training, the CTR went up 172 percent. Moral of the story? Include unique benefits and features in your ad copy. Another example – one of Albright’s clients was a school. When she added enrollment dates to ad copy, conversion rates went up. More relevant information helped ad performance. Pay attention to major factors, like word choice, word order and synonyms. She reminds the audience to always use keyword modifiers and to use “free” whenever possible/relevant. How much does quality matter? Should your display URL be products, geo, CTAs, or something else? Do we need to prequalify clicks? Determine how you want to segment your ad. If on mobile, segment by device. Geddes shared that he recently tested 1.1 billion ads that were run across mobile devices – only 3% used mobile preferred ads. List out your ad tests. Label your ads. Use pivot tables of software to analyze the data. Don’t use brand names in non-branded ad groups. GEOs increase CPI – break out campaigns by GEO. “Calls Us” or “Get Directions” works best on mobile devices. “Learn More” works best on desktop. Note: There is no “winning” ad – what wins for each campaign is different. Use geo-targeting to test mobile lift across devices. Split your market into geographic areas of roughly equivalent population and demographics. This data is derived from the behavior of customers logged in to Google on multiple devices and extrapolated across all traffic. In-store visits: Radio Shack found that 40-60 percent of people who used the store locator function on a mobile device visited a brick-and-mortar location. Micro conversions: Assign a value to events that are likely to influence sales in the future such as user registrations, email subscriptions or catalog sign-ups. Link offline sales: Use a data onboarding partner to assess the impact of mobile advertising on offline sales. Always use mobile-preferred ads with content tailored to mobile devices. Description Line 1 should be written as a stand-alone sentence with proper punctuation, which may prompt Google to add it as a headline. Use mobile-friendly ad extensions to drive traffic to other conversion channels such as a call center or offline line. Call extensions can increase CTR by 6–8%. Ads with locations extensions average 10% higher CTR. Starting Oct. 15, ad extensions may show instead of Description Line 2 ad copy – this change makes extensions all the more important. Ensure that critical info is in Description Line 2. Rotate ad extensions and formats to determine the best-performing variations. Some ad types may perform better on different keyword portfolios, so test constantly. Test different mobile landing pages to optimize RPC. Kristi Kellogg is a journalist, news hound, professional copywriter, and social (media) butterfly. Her articles appear in newspapers, magazines, across the Internet and in books such as "Content Marketing Strategies for Professionals" and "The Media Relations Guidebook." Formerly, she was the social media editor at Bruce Clay, Inc. Head to Kristi's author profile to connect with her on Twitter.